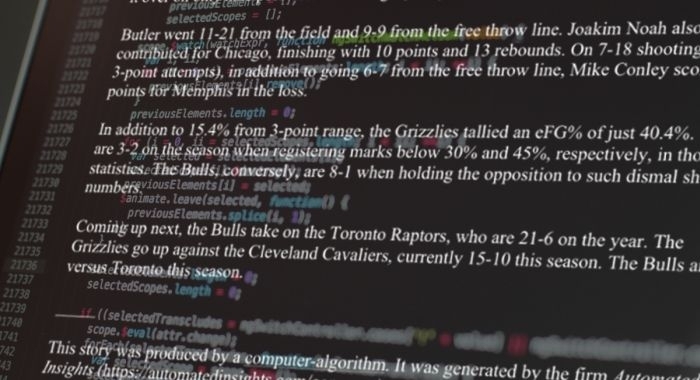 As many news organizations are already using computer algorithms to produce journalistic content, questions about how audiences view these stories arise. Anja Wölker and Thomas E. Powell of the University of Amsterdam, did an experiment on how readers perceive different forms of automated journalism in regard to credibility of the message and source. Their online survey experiment was completed by 300 European news readers. They were shown either 1) an algorithmically generated text with assigned computer as a source, 2) human text with a human source, 3) a combined automated-human text with sources accordingly or 4) a control condition of automated text with no source indicated. The articles dealed with finance or sports. The research finds that human, automated and combined content were mostly seen equally as credible. This was true to both the content and sources. “The co-authorship of algorithm and human journalists have no increasing or decreasing effect on perceived message and source credibility”, the authors infer. For sports articles, automated content was perveiced significantly more credible than the human-written text. Though, the observed difference was rather small. For finance articles, no differences could be observed. Credibility does not mediate the likelihood of news readers to select or avoid a given article, the authors write. In other words, selection was not based on how credible the source was seen. Based on the study, automated journalism can be said to be perceived credible, irrespective of a byline informing about the source. Combined journalism has great potential, the authors conclude, as it frees journalists from more routine tasks and allows them to enhance the automated content with more context and in-depth content. The article “Algorithms in the newsroom?” was published in the journal Journalism and is freely available online (open access).